Perhaps the best place to start learning about New Mexico’s history is at Chaco Culture National Historical Park in the northwestern part of the state. This windswept landscape is home to the massive ruins of what was likely the seat of an incipient empire. Although the area has seen human activity dating back perhaps 15,000 years, it wasn’t until about 900 AD that Chaco Canyon became the center of a powerful cultural and economic system that spread throughout the Four Corners region, into the Great Plains, and even to Mexico. But after just 300 years something went very wrong, and the infant state fell into a bloody chaos of torture, cannibalism, and eventual abandonment. Archaeologists increasingly view Chaco as less a collection of multiple villages, and more as a single teeming city that filled the whole canyon. Find it: Chaco Culture National Historical Park lies in remote northwestern New Mexico, between the towns of Cuba and Bloomfield off US 550. Once off the highway, you’ll travel on a series of well-maintained dirt roads. Some maps and GPS give incorrect directions — check the site for the recommended route. Evidence of human habitation in the canyons of Bandelier National Monument date back many millennia. It was the Ancestral Puebloan people, occupying the canyons in the late 12th century AD, who built the monumental structures and small towns still in evidence today. Tucked into the volcanic mesas of the Pajarito Plateau, the canyon walls are packed with sophisticated cave dwellings, as well as two large villages known as Tyuonyi and Tsankawi. The rock is also covered in tens of thousands of petroglyphs and pictographs, most dating from the period of Puebloan occupation. Puebloan peoples moved into the Bandelier area around the same time as the collapse of the Chacoan political system and the general abandonment of the Four Corners region. The canyons and mesas of Bandelier were themselves abandoned in the mid-1500s with people moving south and east to villages along the Rio Grande, such as Cochiti and San Ildefonso, both of which are still inhabited. Find it: You can reach Bandelier National Monument from Santa Fe by taking US 84/285 north toward the city of Los Alamos. Merge right onto NM 502 at Pojoaque and exit towards the town of White Rock. The entrance to the monument is about 12 miles beyond White Rock. Spanish troublemaker Francisco Vásquez de Coronado had dreams of gold. In 1540, he traveled north from Mexico with what can only be described as a circus-like medieval horde of raiders, cannons, and a few priests. When he arrived at Zuni — 40 miles south of the modern city of Gallup — he found a powerful and widespread culture that had been around for 4,000 years. The Zuni weren’t terribly interested in meeting demands for gold and women — especially from a band of rude, hairy foreigners. Coronado attacked; the Zuni were able to hold him off for a while, then pull the Spanish into a low-level on-and-off guerrilla war that lasted until nearly 1700. This marked the violent European entrance into the American Southwest. Find it: The Pueblo of Zuni is located in the mesa lands of western New Mexico, south of Gallup and near the Arizona border. Take I-40 west from Albuquerque and look for the well-signed roads to the pueblo. Entrance is free. Please respect the culture and religious traditions of the pueblo during your visit. 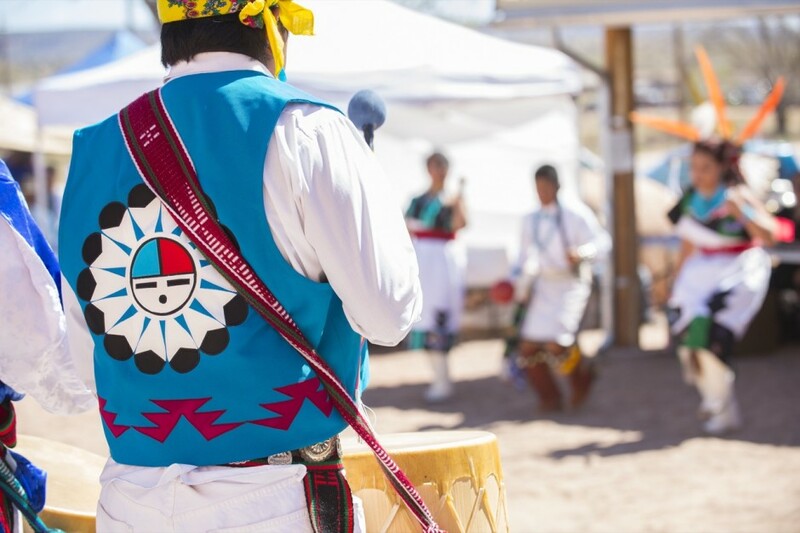 Be sure to visit Zuni Tourism for the latest events, as well as closure notifications. When the Spanish first arrived in the American Southwest, perhaps no place was more populated and wealthier than the Tiwa- and Tewa-speaking towns of the Salinas Valley, about 60 miles southeast of modern-day Albuquerque. Seeing the opportunity to both exploit the wealth of the Salinas inhabitants and convert souls for the church, Franciscan missionaries constructed several massive mission complexes in or near the existing Native American towns. This created a thriving colonial economy and the ecclesiastical headquarters of the Spanish Inquisition in the American Southwest. But a combination of severe drought, resentment among the local people, and an increasing number of Apache raids took their toll, leaving the area abandoned by the 1670s. Find it: The national monument comprises three separate sections: Abó, Gran Quivira, and Quarai. Take I-25 south from Albuquerque to the town of Belen, NM 47 diagonally to US 60, and then 60 east for 21 miles to Mountainair, where you’ll find the park headquarters. Check out the Salinas Pueblo Missions National Monument website for more information. Taos was founded as a Spanish outpost in 1540 near the site of Taos Pueblo, one of the oldest continually inhabited communities in all of North America. An important trading post, the little town sitting at the base of the towering Sangre de Cristo Mountains became significant along the Santa Fe Trail, when American trade flourished between the Great Plains. While interested in the goods and ideas of the young American republic, the people of Taos weren’t so interested in being dominated by the new power. A revolt began in the winter of 1847, and the dark events that transpired still influence the community today. Taos Plaza was the scene of much of the fighting; today it’s a peaceful, shaded spot right in the heart of this art colony town of 6,000. Find it: Taos Plaza is open year round and is surrounded by excellent restaurants, bars, and coffee shops. A number of top-notch museums exploring the history of Taos are within walking distance. You can reach the town from Santa Fe by driving north on US 84/285 and hopping on NM 68 in Española. 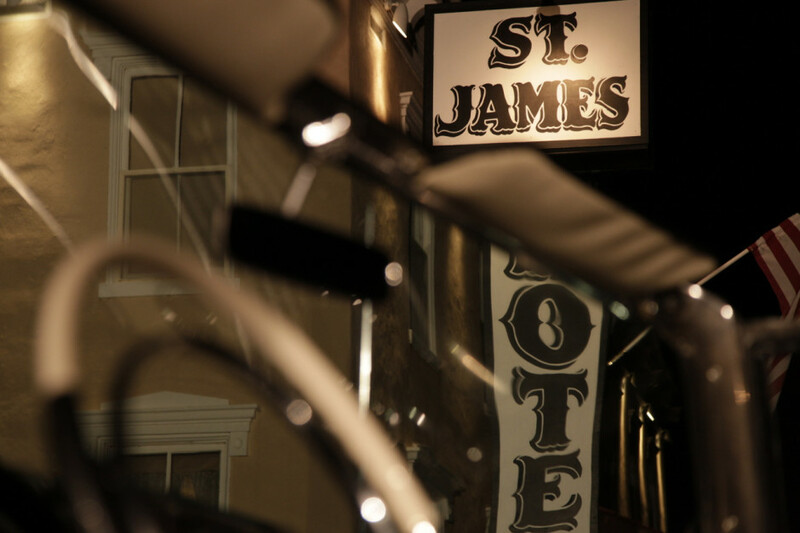 Wyatt and Morgan Earp, Buffalo Bill Cody, Clay Allison, Black Jack Ketchum, and Annie Oakley were all frequent visitors to the St. James, and Jesse James regularly stayed in room 14. Over 20 bullet holes can still be seen in the dining room ceiling. Today the hotel is known both for its fun bar and frequent ghost sightings. Regular tours and weekly historic lectures are run out of the hotel. Be sure to spend a night in the old section. Find it: Cimarron is located in Colfax County. From Santa Fe, take I-25 north about 135 miles to NM 58 and turn west. The trip takes about 2 hours. Visit the city’s website for more details. While the little southeastern New Mexico town of Lincoln isn’t quite a household name, it played an integral part in the story of Billy the Kid and Sheriff Pat Garrett. In 1880, President Rutherford B. Hayes named Lincoln’s main street “the most dangerous street in America.” That was at the height of the Lincoln County War, made famous in the 1988 movie Young Guns. The historic site manages nearly 20 buildings in the town, and because of the well-preserved nature of these Territorial Style adobe structures, Lincoln is one of the most visited sites in the state. Travelers can see the old-courthouse-turned-museum, the incredibly well-preserved Tunstall Store, the jail, and the Anderson-Freeman Museum. Find it: The Lincoln Historic Site is open 7 days a week, with hours that vary by season. Note that the Tunstall Store and Dr. Woods House are closed during winter. Tickets to all the museums run just $5, and Sundays are free for New Mexico residents. Ranger talks take place all summer. At the height of World War II, the US government sought a secret location to begin development of the atomic bomb; they settled on the forested volcanic plateaus of central New Mexico. Los Alamos was established in 1942 as one of the focal points of the Manhattan Project. Unfortunately, the local Native Americans, as well as Anglo and Hispanic settlers already living there, were pushed out to make room for the secret town and the new research facilities. At the time, the people of Santa Fe knew something was happening up on “the Hill,” but it wasn’t until the end of the war that the existence of Los Alamos was made public. Today, the town of 12,000 is home to Los Alamos National Laboratory, as well as one of the highest concentrations of PhDs in the country. The Los Alamos Historical Museum is dedicated to the protection and promotion of the area’s history. Once the residence of General Leslie R. Groves, the exhibits in the award-winning museum range from the story of the Manhattan Project to local geology and anthropology. It’s located just a few blocks from the larger Bradbury Science Museum. Find it: The Los Alamos Historical Museum is open 7 days a week. Docent-guided tours of the historic district are available Mondays, Fridays, and Saturdays at 11am for $10 for ages 18 and up, $5 ages 13-17, and free for children under 12.